Expect Response. Expect Reduction. Expect Relief. A crucial component of stellar productivity is proper sleeping habits. In this second installment of our Productivity Series – we focus on Sleep. Sleep is one of the most important, yet under appreciated, keys to productivity. By not focusing on this essential part of our daily lives – we are only doing further damage to our productivity – and health – as a whole. According to the CDC, 35 percent of Americans report regularly getting less than the recommended amount 7-8 hours of sleep per night. Arianna Huffington, of The Huffington Post, preaches the importance of sleep herself. By not getting proper sleep, not only are you damaging your body for the long and short term, but your output at work as well. Accidents due to sleep deprivation can also be attributed to events on a less disastrous level. According to the Institutes of Medicine, “over one million injuries and between 50,000 and 100,000 deaths each year result from preventable medical errors, and many of these may be the result of insufficient sleep. Doctors, especially newly graduated interns, are often expected to work continuous shifts of 24 to 36 hours with little or no opportunity for sleep.” A decrease in productivity due to sleep-related issues not only effects an employee’s workload output, but can also cost companies thousands – even millions. 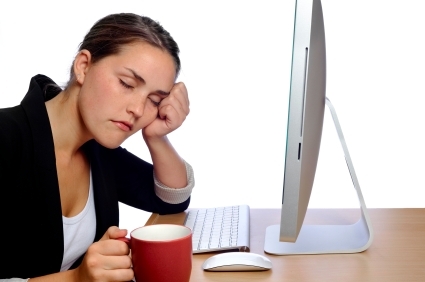 Like any employee or business owner you are now most likely thinking, “I wonder how much money we’re losing due to sleep deprivation?” Unfortunately, we don’t have an answer for you. However, we do have a few ideas on how to encourage proper sleeping habits throughout your office – ultimately leading to increased productivity. Allowing more flexible start and end times may help contribute to positive lifestyle behaviors. Their are many benefits to a more flexible work schedule other than increased sleeping patterns and productivity, but those two are essential reasons to start incorporating a more flexible work schedule. Educate employees on the importance of proper sleeping habits, and how they can improve life both at home – and at the office. Make it clear that occasional sleep loss and fatigue are expected, but teach employees on how to safely and effectively function while “running on empty”. Topics such as regular exercise, proper nutrition, and manageable workloads could all be covered in depth as they are a few important elements when looking to improve sleeping habits. “One of the most significant and overlooked public health problems in the U.S. is that many American adults are chronically sleep deprived.” Not only can better sleep schedules help eliminate one of the worst health problems for working adults, increased sleep increases ability to concentrate, strengthens the immune system and decreases risks of being killed in accidents. Getting more sleep is often times easier said than done. However, as long as you’re more conscious of how important proper sleeping habits are, the more likely you are to change your current habits. There are plenty of reasons to get into a better sleep routine – saving your employer thousands, increasing workplace safety, and keeping your sanity – that it is up to you to put the proper actions in place. InSports Makes An Impact On The Ice! On July 8th, InSports Foundation provided by Innovative Office Solutions held their FIRST ever InHockey camp. This opportunity provided 35 young athletes with a priceless, literally priceless opportunity to improve their game and learn great lifelong lessons on the ice. The InSports foundation is less than a year old and has already had such great success as they reach out to help kids in need. Check out this great video footage as it captures the InHockey camp experience! 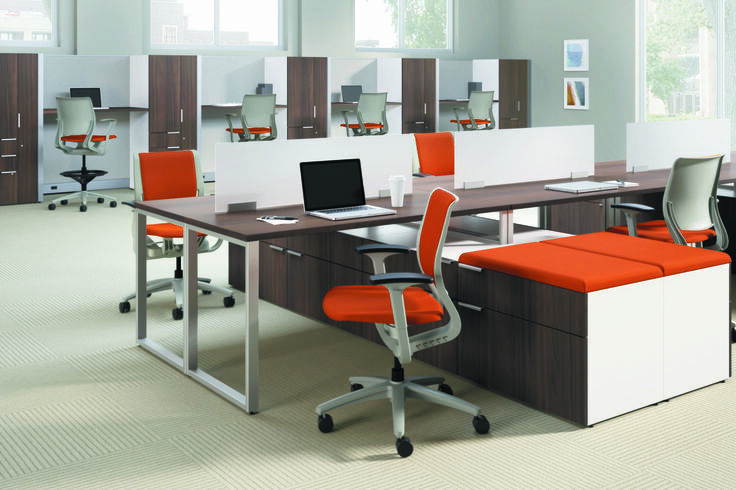 Innovative Office Solutions is your office productivity leader. The following blog post continues our series of posts designed for you to rethink your everyday approach to productivity. We do a lot for ourselves to become more comfortable in the workplace. While spending over one third of our lives at work, we do things we deem necessary to make our workspaces as comfortable as possible. Surprisingly, one factor that gets overlooked too often are the colors with which we surround ourselves. Science and color psychologists – yes, color psychologists – have concluded that certain colors help spark creativity and productivity, while others promote calm and soothing feelings. Take these findings into consideration and begin to use the results to your advantage. You may be surprised by the results. Colors have a much more profound effect on our daily lives than we may realize. Color psychologist Angela Wright states that, “When photons from the sun strike a colored object, that object absorbs only the wavelengths that match its own atomic structure, and they reflect the rest, and that’s what we see. So the different wavelengths strike the eye in different ways. In the retina, they are converted into electrical impulses that pass to the part of the brain known as the hypothalamus, which governs our endocrine system and hormones, and much of our activity.” Basically, based on this explanation, colors have a profound effect on our emotions – whether we immediately realize it or not. In today’s busy world, we’re always striving to increase productivity. It seems like every time we turn around, there is a new app or gadget that occupies us, ultimately diverting our attention and decreasing our daily productive output. It has been found, according to Wright’s research, the more intense the color – the more stimulated we are. The lower the saturation of the color, the more relaxed and mellow we’ll feel. As you may have guessed, different colors have different effects on our brain and ultimately – our emotions. Take, for instance, the traditional primary colors – Red, Blue, Yellow, and Green. Green provides balance between the Mind, Body, and the Emotions. You don’t, however, need commit to one color. If you combine two different colors, you can experience the benefits of each included color. For example, by combining a vibrant yellow with a vibrant blue, you will get a color that stimulates both emotions and your mind. 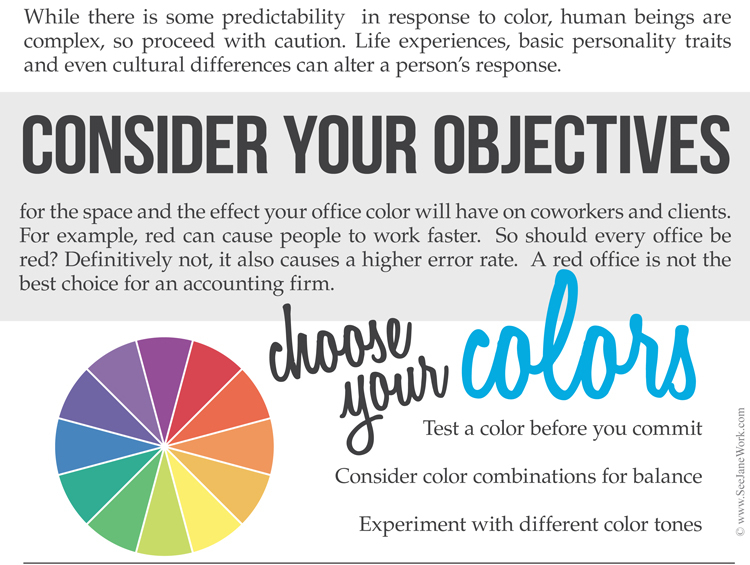 Check out the infographics, via SeeJaneWork, below for more information on the effect certain colors can have on us. So tell us – have you seen first hand benefits by being surrounded by these different colors? 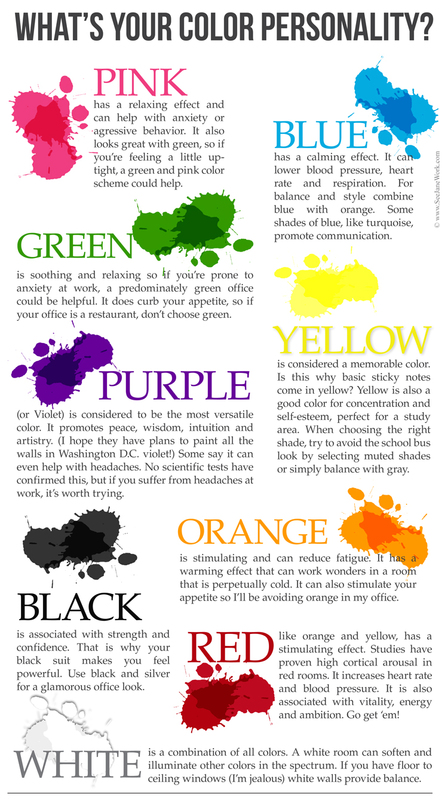 What colors is your office? 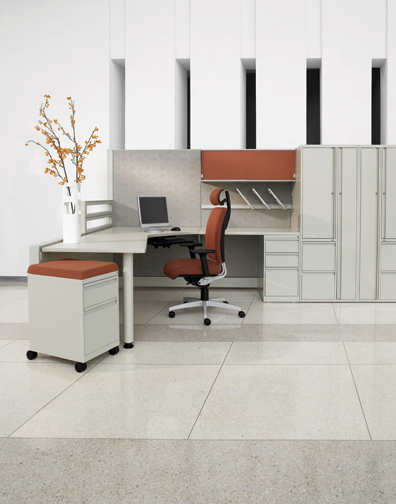 Is it about time you touched up the break room, the creative department, or your office? If you’re looking to spruce up your office space and see what sort of benefits color can have on you and your employees – Contact our experts today at cs@innovativeos.com or call (866) 574-5389 to find out how we can help! You may be reading this while sitting down, and that’s okay. Modern day office culture promotes personal workstations, provided with nice comfy chairs. However, if you’re not sitting correctly, you could be doing irreversible damage to your body. If since you started reading this blog entry, you’ve sat up more straight – you are not alone. This blogger just did the same thing. The following are a few benefits of becoming more aware of your posture – and why you should continue to monitor and correct when necessary. Bad posture creates poor breathing patterns, restricts circulation, strains muscles while creating new injuries, and can zap energy and create constant, low-grade physical pain. Freeing up your posture, alleviating the tension in the many muscle groups from shoulders to calves, will also improve blood circulation – which carries oxygen to the brain – keeping those neurons happily energised and your ability to concentrate enhanced. A recent study conducted by Colorado College showed that male students with a more proper sitting posture had significantly higher test scores than students who slouched. Lead study author, Tomi Ann Roberts Ph.D, states “an upright posture makes people feel dominant and successful, which in turn improves their ability to relax and focus on problems.” Interestingly, according to the study, only male students benefited academically from improved posture – whereas proper posture seemed to have little to no effect on women. This isn’t to say that proper posture in women doesn’t help increase concentration, just that the previously mentioned study found no correlation. There are plenty of products on the market that will help improve your posture over time. One place you should be extremely aware of your posture is at the workplace. Being that most of us often times sit for almost eight hours a day, that is a giant chunk of time during which we could be improving our posture. 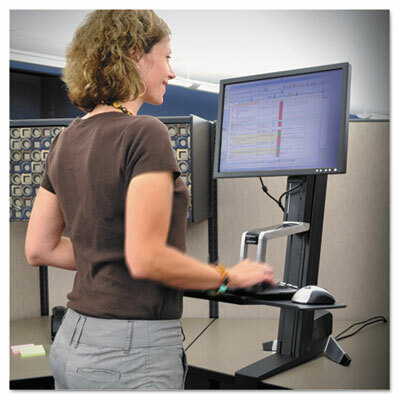 Ergonomic products should be utilized whenever possible as they make everyday tasks that much easier and other products such as sit/stand workstations give users the option to sit or stand throughout the day. According to some, “sitting is the new smoking”. Changing up sitting posture more throughout the day will help activate and stretch different muscles throughout the day. If you’re looking to increase concentration, proper breathing, and improve your overall posture – Contact our experts today at cs@innovativeos.com or call (866) 574-5389 to find out how we can help! Some people may still be skeptical about ergonomic products and their supposed benefits. However, ask anyone who uses these products on a daily basis and they may tell you of the comfort and ease they experience. Work places that currently use, or are thinking about using, ergonomic products can expect to see increased efficiency and productivity throughout the workplace. Ergonomic products help find the perfect fit. The better the fit, the more efficient and productive employees can be in the workplace. Ergonomic products also have some ability to limit and prevent work-related injuries. 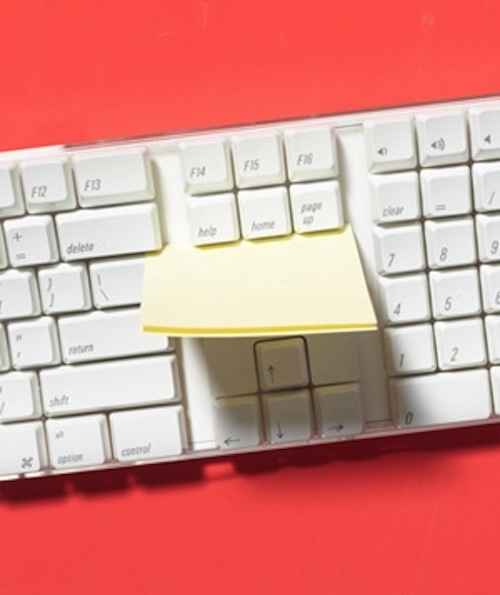 Carpal tunnel being a typical disorder from which some office workers suffer – the increased comfort seen with ergonomic desk items such as mouses and keyboards can help alleviate pain, while increasing productivity and workflow. The more companies continue to put an emphasis on preventing these sorts of injuries, pay-out and days lost will ultimately decrease over time. With the aggressive advancement and increased complexity of technical equipment in the 1940s – it was soon realized that not all benefits of the equipment would be delivered if users did not understand how to correctly use it. Alphonse Chapanis, a Lieutenant during World War II, most notably redesigned aircraft controls using ergonomic principles. In applying these principles, control panel ease-of-use was increased and ultimately helped reduce the number of crashes that had, until then, been attribute to pilot error. The term ergonomics was coined – from the Greek roots (ergon and nomos) – at a 1949 meeting of world-renowned physiologists and psychologists. Later in 1949, this same body of scientists and like-minded colleagues formed the Ergonomics Research Society, or ERS, which became the first such professional body in the world. The group continued to evolve with the changing workplace landscape and begin to incorporate other factors such as workplace layout, light, heat, noise – more physical aspects. The organization is now known as the Institute of Ergonomics and Human Factors (IEHF) and continues to study the benefits and factors that effect people both inside and outside of the workplace. Ergonomics Leading to Increased Workplace Efficiency? Increased productivity for ergonomic products is more or less a case by case basis. Take an ergonomic keyboard for instance. They are so completely different from regular keyboards – there can be a bit of a comfort and learning curve. After a learning period on an ergonomic keyboard, employees can complete more computer-based tasks in the same amount of time – due to the less physical exertion required when using an ergonomic keyboard. Before any redesign or implementation, begin with employee feedback as well as job analysis. Thinking about these things first will better help in your approach to becoming a more ergonomic-friendly workplace. For instance, if employees spend most of their time on the telephone, then it is simply smarter to purchase headsets rather than keyboard and mouse wrist rests. A one-size-fits-all approach to ergonomics will often be ineffective. Sure, an adjustable chair is a critical part of a computer workstation, but keep in mind that shorter employees will often also need a foot rest to maintain proper posture. 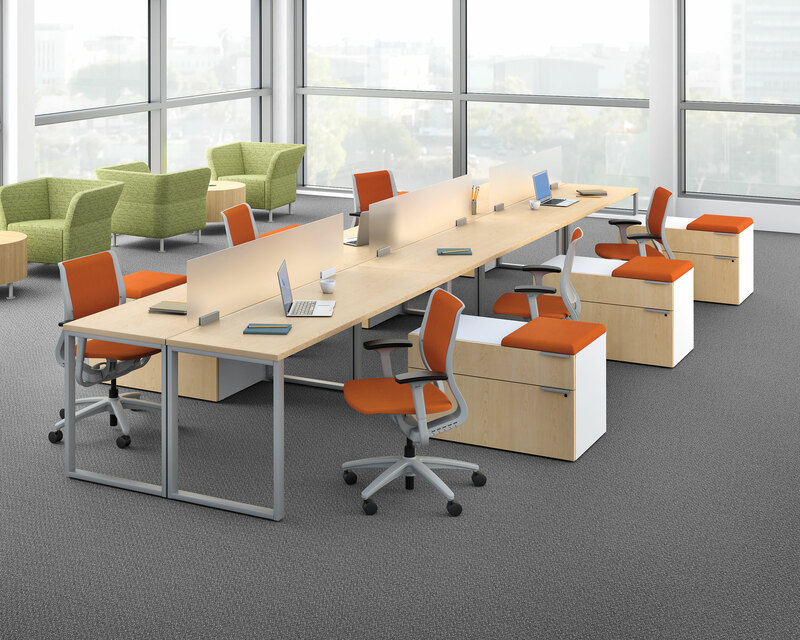 One office item that helps promote proper posture and continued movement throughout the day are sit/stand work stations. The jury is still out on whether or not sit/stand workstations increase productivity, but working in various postures throughout the day is simply better for your health. In a recent study, Scientists at the University of Missouri found that the act of sitting seems to shut off the circulation of a fat-absorbing enzyme called Lipase. If a sit/stand workstation is not an option, it is recommended that office workers vary their posture throughout the day. If you have yet to adopt ergonomics in the workplace, or are thinking about trying out some ergonomic products for yourself, visit www.innovativeos.com for all of your ergonomic product needs. Too much clutter at your desk? There are solutions. Below are some “office hacks” that are sure to help increase your productivity throughout the day! 1. Don’t have a can of condensed air handy? 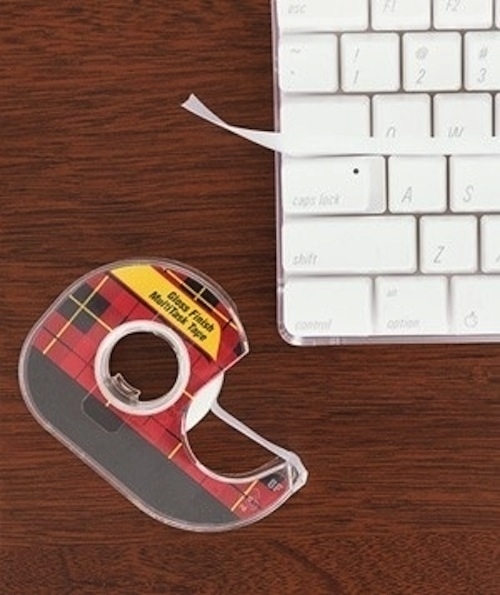 Grab a few pieces of Scotch Tape or Post-It notes and run them through the cracks and crevices of your keyboard. Most unwanted gunk will stick to the adhesive, letting you then throw it right in the trash. This solution will surely tide you over until you can get some condensed air. 2. 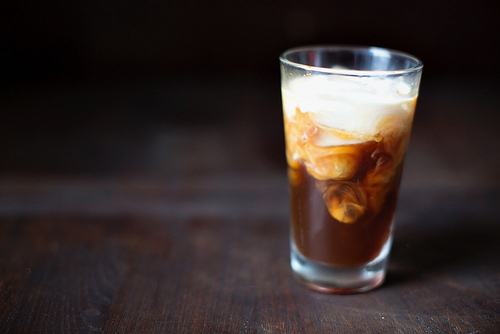 Lets be honest, you may not be jonesing for a cup of hot coffee in the middle of July. And much to your chagrin, that is all the office currently has. 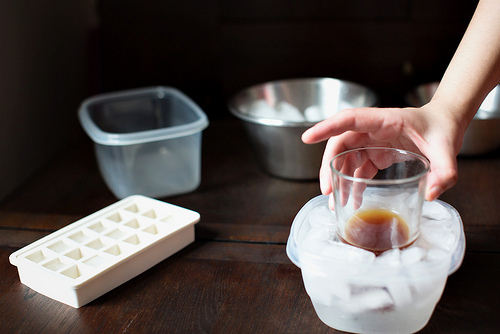 Fear not, with this workplace coffee hack – you’ll be sipping on iced coffee in no time. 3. 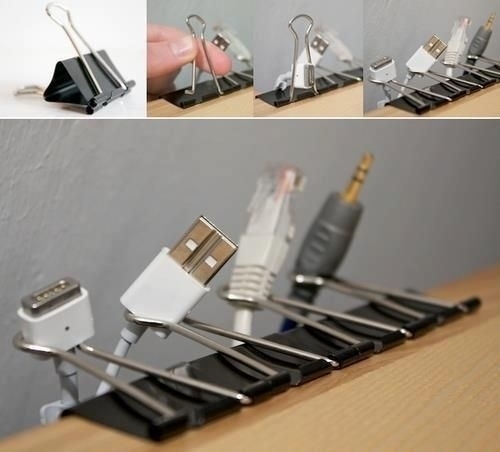 Cut back on clutter by using binder clips for loose and excess wires. Some desks may not be a good fit for binder clips as wire holders – if that is the case, there are countless other accessories built specifically for wire organization. 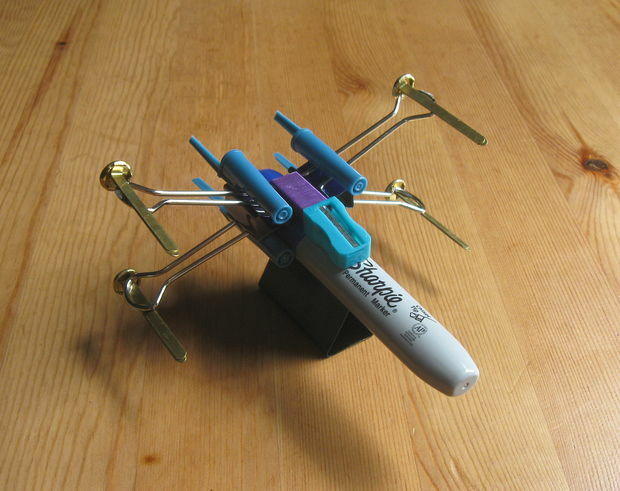 However, if you’re in a pinch and just can deal with the clutter anymore, binder clips are the perfect solution. 4. Sharpies are great for countless things – from decoration to DIY projects, they can do it all. But did you know you could add wardrobe touch-ups to their endless list of capabilities? Do your pumps or heels need a quick touch-up? Break out that Sharpie and you’re good to go! 5. Sponges make a great substitute for regular ice packs. 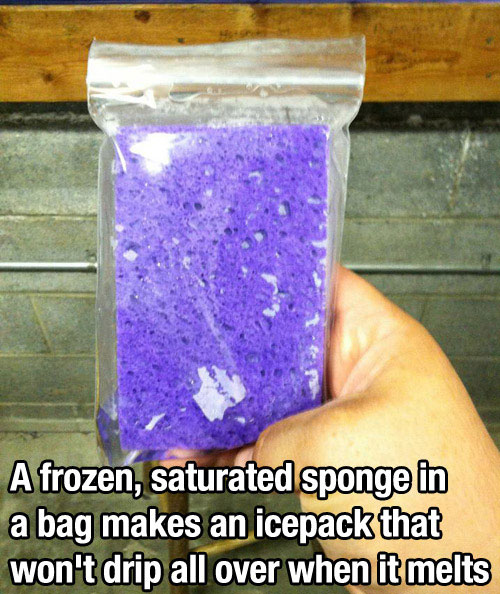 By putting a wet sponge into a sandwich-sized plastic zip lock bag and freezing it, it will make a perfect, non-soggy ice pack you can keep in your lunch. Stash a few at the office as well as they are a fairly inexpensive and space-saving alternative to the traditional icepacks. Hopefully these tips will help you stay productive throughout the day – and have maybe given you a few ideas for increased productivity at home, as well as in the office! We’ve all experienced it – the midday slump. That groggy, sleepy, “It’s only 2:30!” feeling. Read below to find out why it happens and how to fight it off tomorrow. Late nights, early mornings, kids, pets, emergencies, etc. – they can all lead to a long day at the office. Once you indulge in your favorite coffee or tea in the morning, you’re usually set for at least a few hours. Then the midday crash comes along – and when it greets you, it can be relentless. Read on for some information on why it happens – and what you can do to prevent this relentlessness that is the midday slump. One of the two main reasons this happens is because of a drop in our core body temperature. Funny enough, this happens right before we go to bed – but on a much smaller scale. When our core body temperature decreases, our brain releases melatonin – the main chemical associated with sleepiness. Sure – these chemical reactions are natural and sometimes cannot be avoided. But the aggressiveness of these chemical reactions can be reduced by one simple factor – our diet. Without the proper nutrition, that “2:30 feeling” is sure to stick around for longer than desired. Sleep tight – Aim for getting between 7-9 hours of sleep per night. Some people can function on less sleep – but the desired, science-backed amounts are between 7 and 9 hours of sleep. “Strong to the finish, because I eats my spinach” – Eating healthy, protein-packed foods with both breakfast and lunch meals can help keep you awake, and full, for longer. Reduce sugar intake – as delicious as it may be, you could only be hurting your body in the long run. For instance, when you consume too much sugar, your pancreas secretes insulin to nudge that extra sugar into your cells, and too much insulin can deplete your normal glucose levels, depress your immune system, and lead to kidney disease. Stay active – take a walk during a lunch break, stand up and work for a few minuets. Silence the hunger – eat smaller, healthier meals more frequently throughout the workday. The dreaded “2:30 feeling” shouldn’t simply be drowned out by guzzling coffee and eating sugar – however tempting that may sound. With a healthier approach to your daily life – and being more aware of what can cause your midday slump you’ll forever silence the urge to power nap at work, and will become a healthier person in the process! Check out http://www.innovativeos.com for all your caffeinated drink needs, along with healthy desk snacks to power you through the day! February 14th is right around the corner – and below are some tips to keep in mind when celebrating at the office. Valentines Day at the workplace can be a tricky thing. Flowers, sweets, others not celebrating – it may not be for everyone. But if you are celebrating, there are a few things to keep in mind when bringing your Valentines Day enthusiasm to the office. Trying to plan your evening? Do it during off-hours. 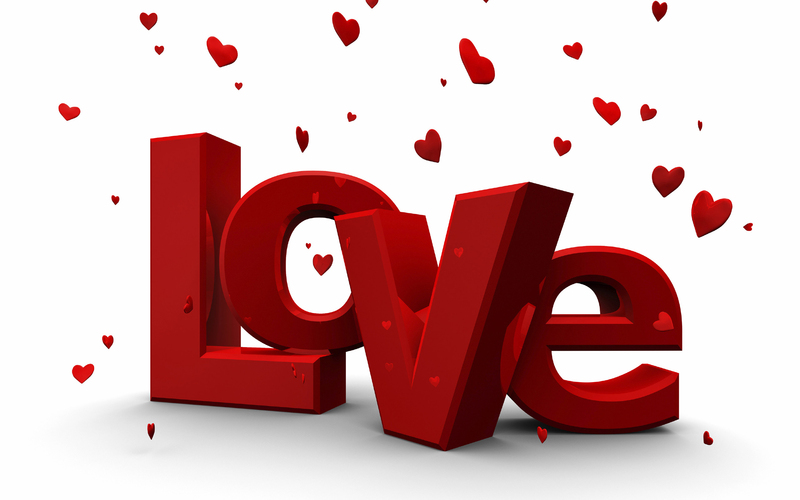 If the unavoidable panic of Valentines Day begins to show at the workplace – notice it immediately and shake it off. Once you’ve left the office, then start planning. Do you know of a great new restaurant downtown that just opened? Does your guy or gal have a favorite spot they like to frequent? Well, so does everyone else. Everyone has been dying to get into that new place downtown, and everyone has a favorite spot they like to go to. 34.6* percent of those who celebrate Valentines Day do so by dining out. Keep that number in your head, be prepared, and plan ahead. Some people often forget that not everyone celebrates Valentines Day. Whether due to personal reasons or as a form of protest, others may not receive roses, chocolates, candy hearts or a sing-o-gram at the office. Keep this in mind when you’re heading to the reception desk to pick up your special delivery, and when heading back to your desk. Be as subtle as possible as not to draw too much attention to yourself and possibly inadvertently upsetting or hurting the feelings of a co-worker. 34.3* percent of those who celebrate Valentines Day receive flowers – if you do, simply be mindful of your coworkers. If someone comments, respond politely! Look, just because your Valentines Day card box is empty, or your desk isn’t covered in roses doesn’t mean you should bring others down to your level. Let the gift recipients have their fun. Look at it this way – tomorrow you get to indulge on all of the half-price Valentines Day chocolate. Everybody wins. Who says you need just one Valentine? Okay, most people would say you can only have one. But if you don’t have one, why not celebrate with office team members? Being that some in the office may not be celebrating “The Day Love Costs Money”, bring in snacks for the whole department or team. It will be appreciated by everyone – single or otherwise, and would help build rapport throughout the office. Check out these Valentines Day-themed recipes and indulge! If you have an office “crush” – Valentines Day isn’t the day to let it be known. It is neither the environment, nor the most proper of office conduct. Be professional in your approach to workplace Valentines Day festivities. Use discretion in a situation like this – the last thing anyone wants or needs is a trip to HR. Make Valentines Day at the office fun! Enjoy it with co-workers, marvel in the amount of sweets that fill the office on this day, and indulge to your hearts content. Counteracting that 2:30 pm feeling at work – and having fun doing it. For those of you who feel the workday sometimes drags along and time stands still – you’re not alone. There are countless ways to go about counter-acting this feeling, but below we have outlined 5 that may be most effective. 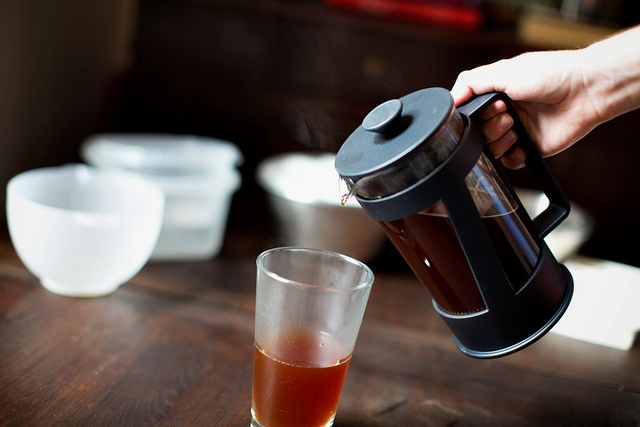 One of the most important parts of your day is getting it started right. It has long been a belief that the longer the commute, the more relaxed you are when you get to work, and when you get home. Sure, weather and traffic jams can quickly turn an enjoyable commute into a headache, but there are plenty of things you can do to make the commute as enjoyable as possible. Try a different route from time to time or listen to a podcast instead of the radio. An often-overlooked solution is carpooling – you’ll have company during your commute, and you wont be driving as much as you would, had you commuted alone each day. If you think your work is dull, easy and repetitive – start overachieving. Nothing will keep you more engaged than taking on a new task and focusing on knocking them out of the park. Get started on that next project. It will get the attention of your superiors, keep you busy, and may ultimately help you “climb the corporate ladder”. The harder you work, the busier you are – the busier you are, the faster your day will go. It has been thought that when you spend a lot of time working on one particular task, you should take a break from said task for an extended period of time. When doing this, your subconscious continues to work out the issue, while you work, or play, elsewhere. Plus, if anyone says they can focus for 8 hours straight, they’re lying to you. Take breaks and know that your brain is still working on the issue at hand, but now sub-consciously. As previously alluded to, you’re still working on things even when you’re not working on them. In most cases, you are more likely to solve the problem when you’re not completely focused on this main task. According to this nature.com article, “allowing the brain to enter the state of zoning out when it is considering complex problems can have real benefits. Zoning out may have aided humans when survival depended on creative solutions.” So embrace the boredom – it may just lead to a revelation. These are just 5 helpful tips to remember when starting out your workday. Of course there are plenty of other ideas: Drink caffeinated beverages more frequently, clean your desk, or create things out of office supplies. Embrace the boredom – it may just lead to a revelation. Using re-fillable soap dispensers can make hands dirtier than when you first stepped into the washroom, leading to the spread of germs and sickness and doing the exact opposite of what soap is meant to do: Keep you Clean! Usually when we think of soap, we think of cleanliness and a fresh fragrance. However, certain soap dispensers can contain bacteria that is much more harmful than the stuff we run into during our daily lives, and that bacteria can end up making us sick. Refillable soap dispensers have an open reservoir, which can lead to bacterial contamination and the formation of a bacterial biofilm inside the dispenser – which remains even after cleaning the dispenser with bleach. The remaining biofilm can then contaminate the new soap, continuing the cycle of spreading bacteria and potentially sickness as well. According to a 2011 study, these types soap dispensers can increase disease-causing bacteria by up to 25%, leading to increased sickness and a higher probability of transferring bacteria to other surfaces. After washing with contaminated soap, hands can have 25x more germs and the germs can cause illness that leads to fever, vomiting, and pink eye. These symptoms can all be avoided by switching to the safer option of sealed re-fill soap systems. By doing this, employees and co-workers will stay healthier longer and in turn, a healthy workplace environment will be created. About office productivity, new products & tools, our environment & community.